The Houston Astros and Los Angeles Dodgers both moved on to the LCS on Monday, downing their respective opponents the Boston Red Sox and Arizona Diamondbacks. With the Cleveland Indians' loss to the New York Yankees, forcing a fifth game in the ALDS, LA becomes the new World Series favorite. The Washington Nationals will head into the not-so-friendly confines of Wrigley Field today Wednesday facing long odds to advance and hoping to force a fifth game in DC. 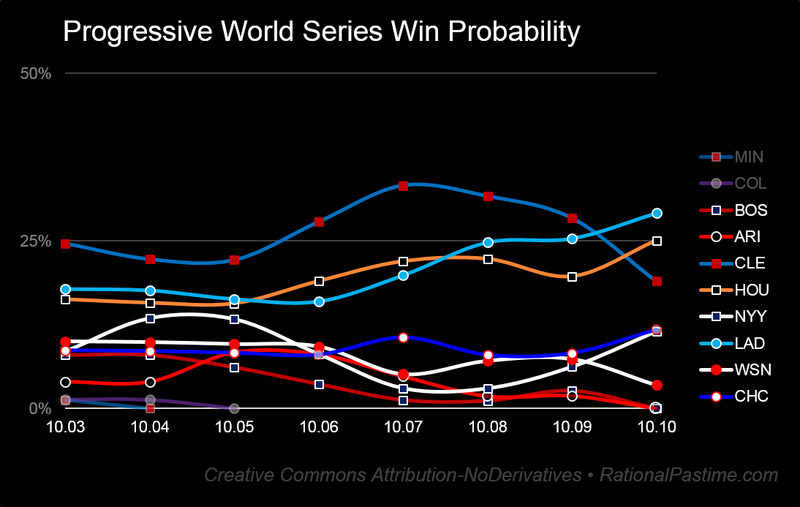 For the first time since the start of the preseason, the Cleveland Indians are not the most favored team to win the World Series. That honor currently goes to the Dodgers, 7:3 favorites, followed by the 3:1 Houston Astros. With their postseason in the balance, the Nats' 23:1 odds are their worst yet in October. Houston finished off Boston in four games. 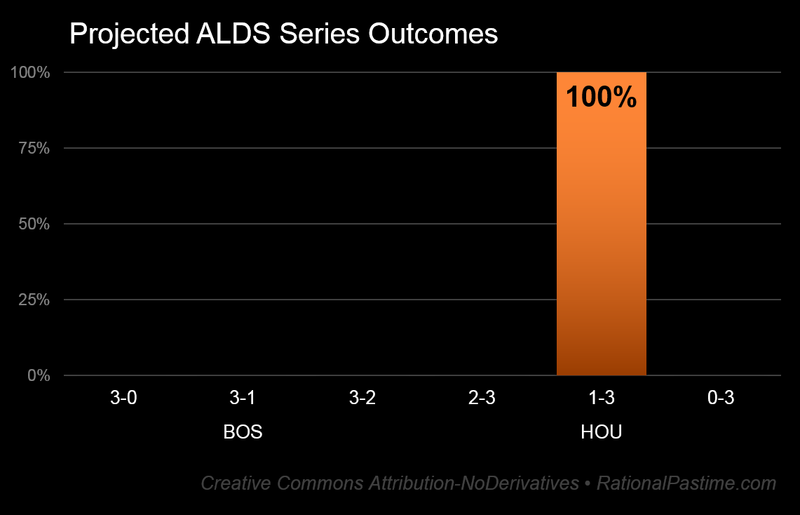 This was the second-most likely outcome predicted by my model at the start of the series, with a 21% likelihood (a five-game Houston victory was the modal projection at 23%). For the second time in three games, the Washington Nationals squandered six innings of no-hit baseball by one of their two dominant aces. 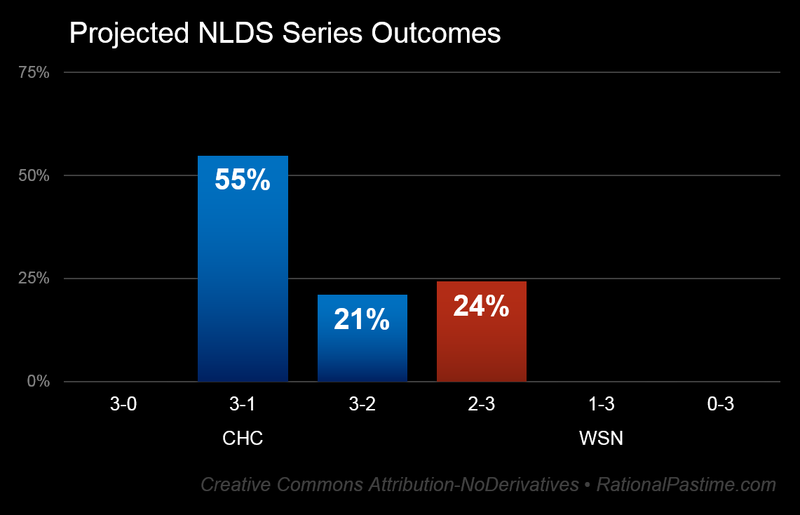 They now face the precipice of defeat, likely to fall to the Cubs in this best-of-five NLDS. However, if the Nats can hold on in game four, they will be slight favorites to win a fifth game in DC and advance to their first ever NLCS. The Yankees needed to win three in a row after dropping the first two games in Cleveland. New York has won the first two, but they still face an uphill battle against the Indians, needing a win on the road to complete the upset (a 44% possibility). 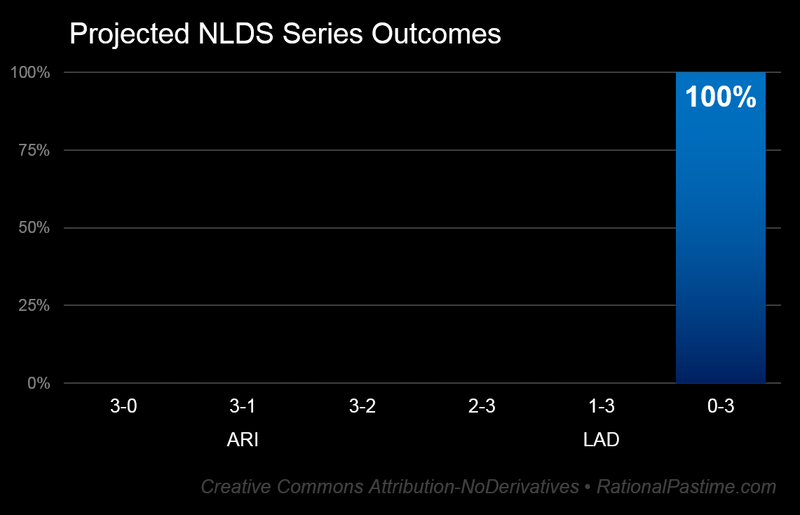 At 16%, a Dodgers sweep of the Diamondbacks was the fifth most likely outcome projected by my simulator. 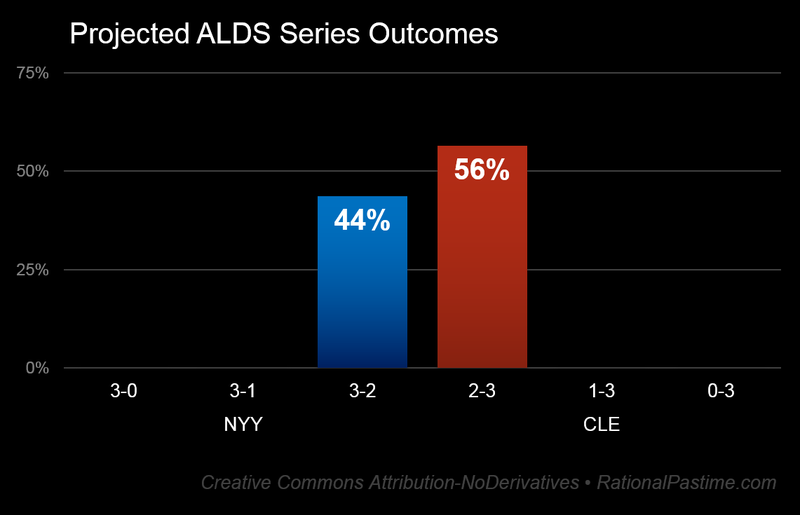 A Cleveland Indians five-game victory over the Los Angeles Dodgers in the 2017 World Series has slipped from the most likely discrete outcome to the seventh most likely. A Dodgers victory over Houston in seven now tops that leaderboard. 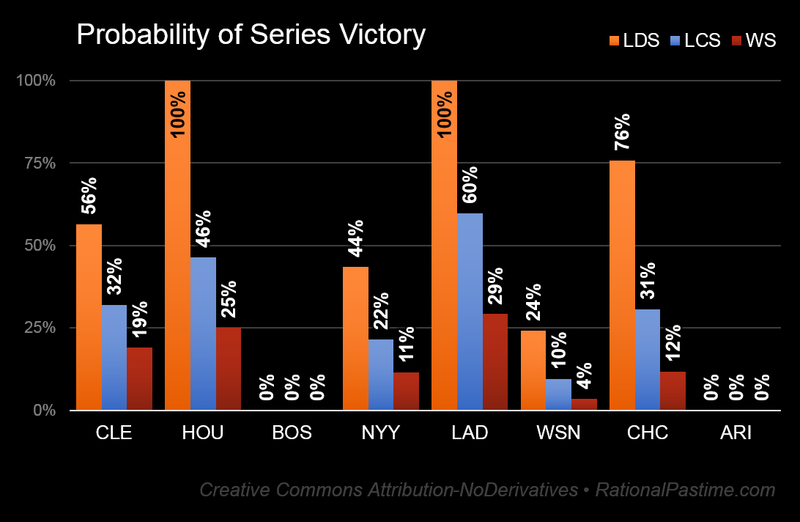 The outcomes of today's contest Wednesday's contests will have a measurable effect on both the teams directly competing and the World Series chances of the four two other teams that remain in the playoff field. Check back tomorrow Thursday to see how game four of the Cubs-Nats NLDS and game five of the Yanks-Tribe ALDS affects the playoff picture.